In Yalda's universe, light has mass, no universal speed, and its creation generates energy. On Yalda's world, plants make food by emitting light into the dark night sky. And time is different: An astronaut might measure decades passing while visiting another star, only to return and find that just weeks have elapsed for her friends. On the farm where she lives, Yalda sees strange meteors that are entering the planetary system at an immense, unprecedented speed - and it soon becomes apparent that more of this ultra-fast material is appearing all the time, putting her world in terrible danger. An entire galaxy is about to collide with their own. There is one hope: A fleet sent straight towards the approaching galaxy, as fast as possible. Though it will feel like weeks back home, on board, millennia will pass before the collision, time enough to raise new generations, and time enough to find a way to stop the ultra-fast material. Either way, they have a chance to save everyone back on the home world. What did you like best about The Clockwork Rocket? What did you like least? As with other works by Egan, it's an excellent exploration of scientific ideas & "what if" physics thought-experiments in story form. 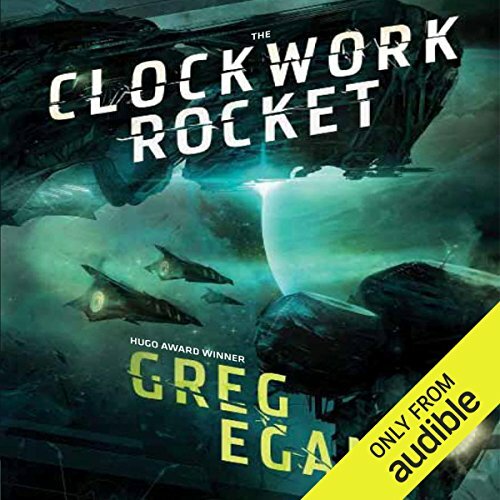 What other book might you compare The Clockwork Rocket to and why? 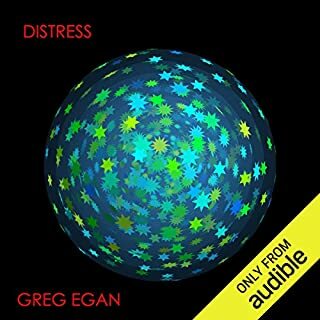 Other work by Egan? 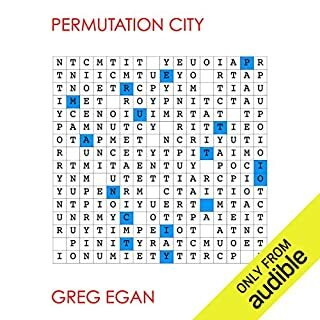 Otherwise Egan's works are difficult to find direct comparisons for. The narrator has an extremely monotonous pattern to his speech. Nearly all non-dialog is spoken in the exact same pattern of intonation and emphasis on words & phrases. As though he decided that every 4th work would have higher intonation & emphasis, no matter it's actual use or importance in the sentence. Dialog isn't much better, with character voices that sound almost universally to be whining or sad. Was The Clockwork Rocket worth the listening time? 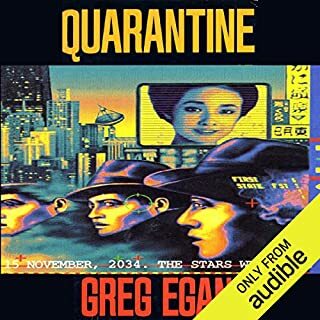 If you're a fan of Egans work, then yes; Otherwise, the narration is likely to turn off listeners, possibly even other fans of Egan. 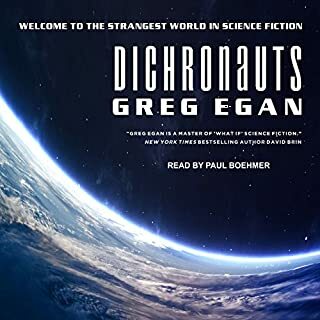 This novel follows the familiar formula that Egan fans delight in: an alien hero works out fundamental physics to defend his/her/its species in a race against impending cataclysm from natural forces that are not, initially, well understood. Here, the greatest stylistic twist is that there is no counterpoint perspective from a more familiar human or near-human protagonist, nor indeed, any additional first-person characters. The story is told in a sequence of episodes from the lifetime a single creature, our protagonist Yalda. Her planet and species are never named, being alone in their perceived cosmos, so I’ll call them ‘Orthogonals’ in reference to the unique premise that the story stems from. 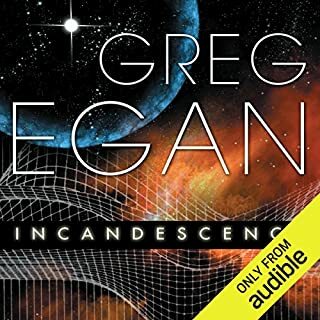 I can’t do any justice to the carefully described mathematics provided at every step of the hero’s journey, but can summarize by saying that her pocket universe has a different, orthogonal geometry from our own, and Egan has extrapolated this to invent a marvelous and internally consistent set of physics for her to discover along with the reader. The novel’s theme is also a familiar one: The triumphant of applied science and nobility of those who practice it’s careful pursuit. Egan even pays homage to history’s persecuted and martyred scientists by including a dash of this to the ‘Orthogonal’ civilization he’s created. In his world, however, the selfless scientists manage to escape their adversaries and found a society of their own, where all injustices are banished and the whole community labor together for the common good and a grand project to rescue their planet. Great care is given to the details of each discovery and the particulars of the plot are largely devised in service to this exposition. I feel the story would have been more engaging and the characters more relatable if these narrative priorities could be reversed. I also would have enjoyed more interpersonal conflict and greater moral ambiguity in the characters, who all felt a little too single-minded and one dimensional (no mathematical connotation intended). Yalda particularly, is a bit too righteous, and would have been much more interesting with some dramatic flaw or dark angle. Her one social handicap is an unavoidable accident of nature, completely a faultless situation, that makes her subsequent sufferings at the hands of the unenlightened seem in parallel to historical figures like Alan Turing and other victimized minorities. The story ends with moderate abruptness, although not exactly a cliffhanger, and the largest question tensely unanswered in anticipation of the follow-up novel(s). However on its own, it still stands suitably complete, and will satisfy the reader. Caveat: I tried very hard to finish this book, but I gave up about 2 hours from the end. So, maybe there's some big reveal that makes the rest of this mess worth it, but I wasn't willing to stick it out any longer. The narrator was bizarre. His entire speech pattern is choppy, and he makes a lot of bizarre choices with character voices. A lot of the characters sounded either drugged or severely depressed. I usually have a high tolerance for poor narrators, but Mr. Epstein was bad enough that I'll think twice about listening to anything else that he narrates. Worse, huge chunks of this book are tedious descriptions of made up physics. I really liked the idea of a story set in a universe with different physics than our own. However, I'm not interested in hearing the details of the equations that govern light in that universe. A little bit would be good, so that the reader could get a handle on the "rules of the game," but there's way too much of it. It's like if you read a fantasy novel that not only described a system of magic, but also described all the necessary wand movements in excruciating detail. The book repeatedly jumps forward in time by a few years to move the story along. It's jarring, and it gets in the way of developing an attachment to the main character. All of the skipping forward means that every character point is "developed" with a sledgehammer. There's no time for Yalda to grow, she just gets hit over and over with major life events. Finally, this book seems to be trying to explore some feminist themes, but everything it has to say on the subject is so basic that I can't even begin to call it provocative. Nonetheless, Greg Egan seems to really want the reader to know that oppressing women is bad. He mainly presents this earth-shattering insight by repeatedly creating flat female extras and then assaulting or killing them. It's the "woman in a refridgerator" trope bizarrely used in support of (again, the most basic possible) feminism. Clockwork Rocket is a story you read for the physics. I recommend reading the first chapter, which is the only well written, the supplementary material and finding a summary of the rest of the book since only a handful of the 20 chapters contain any of the physics. Adam Epstein is incredibly monotonous, but after a while you learn to focus on the story he’s reading anyway and at least he’s understandable. All in all, I can’t really recommend buying. 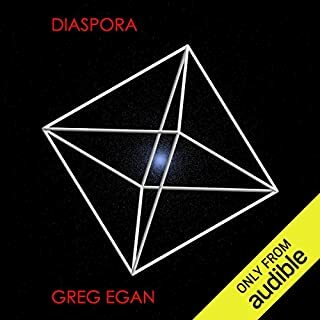 Would you ever listen to anything by Greg Egan again? I simply could not get my head around the basis of the plot.